The Jacksonville Jaguars have announced that QB Blake Bortles will enter the regular season as the team’s starting quarterback. The fourth-year quarterback was demoted behind Chad Henne for the team’s third preseason game against the Carolina Panthers, but apparently showed enough in the game to warrant the starting job. Bortles completed 12 of his 16 attempts against the Panthers, and posted an adjusted completion percentage of 81.3 percent, which bettered Henne’s mark of 69.2 percent. Bortles also performed better while throwing under pressure, and posted a passer rating of 104.2 on such throws, bettering Henne’s mark of 39.6. 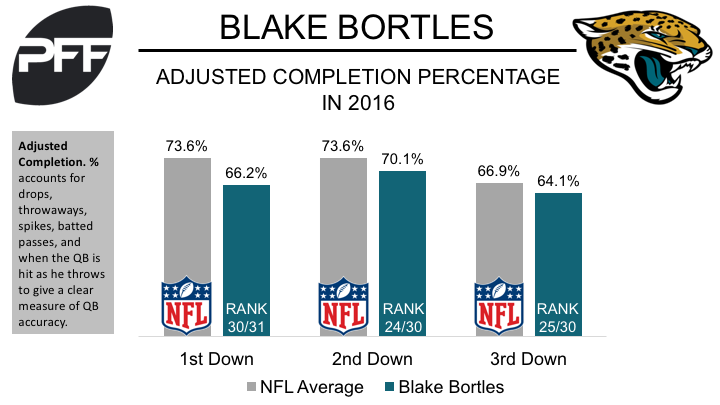 In 2016, Bortles was one of the most inaccurate passers in the league, posting an adjusted completion percentage of 69.7 percent, which ranked 24th of 29 quarterbacks with at least 330 attempts. He especially struggled on third down last year, posting an adjusted completion of just 64.1 percent on third-down throws, which ranked 25th of 30 quarterbacks with at least 100 attempts. Bortles also threw 10 of his 16 interceptions on third down, the most among the league’s signal-callers.